There are only 15 spots available, so RSVPing on the Urban Homesteaders' League Meetup page is required. (You will need to join the group, but you can always leave the group after the demo). For more details on the demo and to RSVP, please go here. I have been lucky in that I have never encountered mold when brewing kombucha. Kombucha has been found to have a low rate of contamination and of mold, and has been found to be safely prepared at home (1). Kombucha's low risk of contamination results from its natural anti-microbial activity, attributed largely to the presence of acetic acid according to the Cornell study (1). Kombucha's low pH also helps to prevent undesired microorganisms from proliferating. Remember that kombucha mushrooms come in all shapes, sizes, and colors, and colors can range from creamy white to all variations of brown. 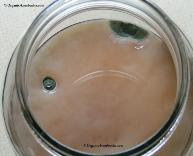 And if you've never seen the development of a SCOBY completely from scratch, look at my photos from Experiment 1, Growing Your Own Kombucha Mother. If you do suspect mold, remember that it should appear FUZZY such as the mold you see on bread. If your kombucha mushroom does form mold, the safest thing to do would be to throw out that batch and that mushroom, and to brew with another mushroom- another great reason to have a backup mushroom in storage. I've talked to several people who have cut off the mold-infected part of the mushroom and continued to use the rest of the SCOBY, but do this at your own discretion! If imperceptible mold spores are in the rest of the mushroom or in the brew, this could cause problems for the next batch, so you may want to start anew! 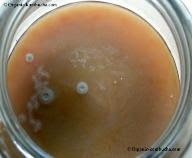 More info on mold can be found in Happy Herbalist's Brewing Guide and Kombucha Photos page. 1. Greenwalt, C.J., R.A. Ledford, and K.H. Steinkraus. "Determination and characterization of the anti-microbial activity of the fermented tea Kombucha." Lebensmittel-Wissenschaft und-Technologie 31 (3) (1998): 291-296.